For Young Carers Awareness Day 2019, we’re sharing the story of Lucie, age 9 and her mum Sharleen. In January last year, Sharleen was diagnosed with breast cancer. Following chemotherapy, a two and a half week stay in hospital with pneumonia, a mastectomy and radiotherapy in August last year, Sharleen was told the devastating news that her cancer had continued to spread and was terminal. When Lucie asked: “Are you going to die mummy?” Sharleen had to say: “yes I am”. Since day one, Big C have been there to help Sharleen and Lucie. They came into one of our Support and Information Centres almost straight away, Sharleen says: “If you go in feeling upset, you don’t leave feeling upset. Lucie has been helping to care for her mum since the diagnosis. Sharleen says: “She helps me to get stuff, now the cancer has spread to my lungs it’s hard for me to go up and down stairs a lot, so if I need something she will be straight up to get it, she’s more than willing to help. She’ll say to me, ‘sit down, you’ve done too much’. 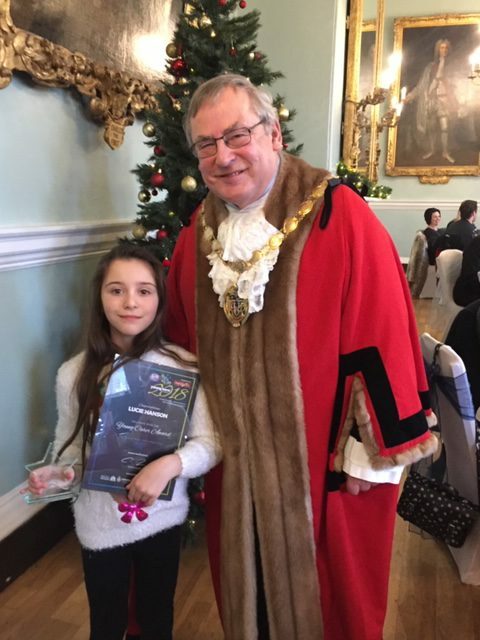 Pictured is Lucie with the Mayor.